My Toddler Is Going To Preschool, and I'm Extremely Nervous! When Kyle starts to walk, my friends and family were asking me if I'll enroll him to school. It was always a "no" because it is our decision (as parents) to let him enjoy his time at home with the parents and learn basic knowledge and manners from us before we let him go! He finally turned 3 last April and we told ourselves 3 is the perfect age for us to enroll him to Preschool. It was our decision to take him to a preschool before he goes to big school because our family is really small! We don't have kids AT ALL! And most of the kids around our area are "home bodies" too so he doesn't get to play around with kids his age! Now, if you ask me, I am at my most nervous stage right now since his first day of school is next week! But of course, I can't let that nervousness and possible "separation anxiety" get the best of me! Mr. AMW and I have done preparations before THE BIG DAY! I'll share you some tips that I'm currently doing and I would love to hear your ideas fellow mommies! 1. We send him to "play care" on weekends just for him to "feel" the environment of being in school. Playcare at Little Archer SM MOA, written a very positive review about our experience here but unfortunately, we had to look for another "school" because it is too far from home! I can't imagine the stress of driving him to and from school with traffic that could last an hour plus EACH way! That would be super stressful for my son! Now, if you don't have means to bring him to Play Schools, or if your schedule does not permit, you can take your toddler to kid-friendly areas like Kidzania, Kidnooza or random playground inside the malls! And of course, you can always take him with you when you do adult activities like grocery shopping and I'm sure they will find their favorite spot! As for Kyle, his favorite spot is the fruit section! 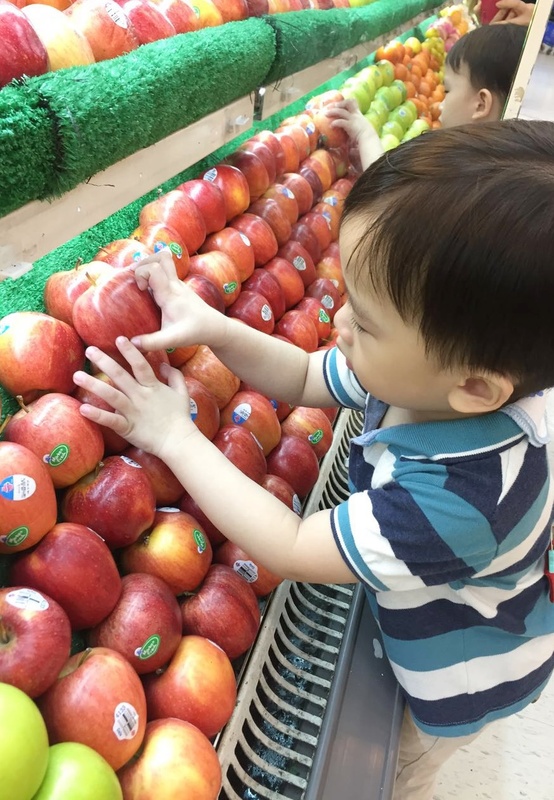 He also gets to identify the names of fruits and vegetables! 2. 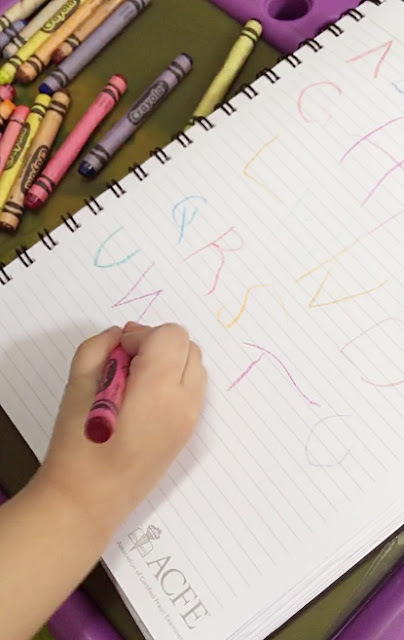 Create school-like activities at home whenever your child feels like it! Get to know what he likes to do or his favorite subjects or activities are. As for Kyle, baking and cooking is one of his favorite bonding time with mommy! So I definitely include him whenever I can if I have time to bake or cook! If he's in the mood, we always do a couple of writing, reading, singing and dancing! 3. If you found the right Preschool for your toddler, visit your child's school and classroom a few times before school starts for him to be familiarized with the space or environment. 4. Prepare his things and bring comfort objects from home. I have already prepared his school bag! As much as a 3 year old do not need a lot of things for school, I'm sure he would want to have something he's used to having whenever we go out! Such as his favorite "bag" which was gifted to him by his Aunt! Inside, I will make sure to include items that he is used to seeing! As the mommy who has the most separation anxiety, I am actually practicing the "I'm okay that I'm leaving you because I am confident that the teachers and school will take care of you" look! I know that I should be calm and confident as my child can definitely sense that! While waiting, I'll probably keep myself busy with games! Thankfully, there are online games as of the moment because my phone doesn't have enough memory anymore with all the #KyleNash photos and videos! With Big Bytes 50, Smart subscribers can make the most of the newly launched YouTube Gaming app, which features engaging game plays, reviews, speedruns and trailers covering hit games such as Minecraft, Grand Theft Auto, League of Legends, Call of Duty, DotA2 and NBA2K16, among tons of other titles. And of course, I will never do the sneak-out number! I know it is tempting to sneak out when your child is busy but that would risk having your son not trusting me! I'd rather make sure to give him maybe a tearful goodbye especially on his first few days but at least, as days go by, he will know that after every goodbye, there will always be a hello! What other tips can you share for first-time-mommies with toddlers going to school? BabyAMW or should I say toddler AMW lol (My Mom still calls our shotie baby). Kyle grows fast I still remember your post announcing that you are expecting and I can't help but rejoice with you (I was still in college notice that I looked silly and happy while they're nervous and serious doing our research lol!). As a child I remember that I don't have separation anxiety at all. I was conditioned by my mother not to cry when she was away because she explained to me that she has to work with my Dad.